Kanade has prepared a special hakama for the Eastern Meijin Qualifier. 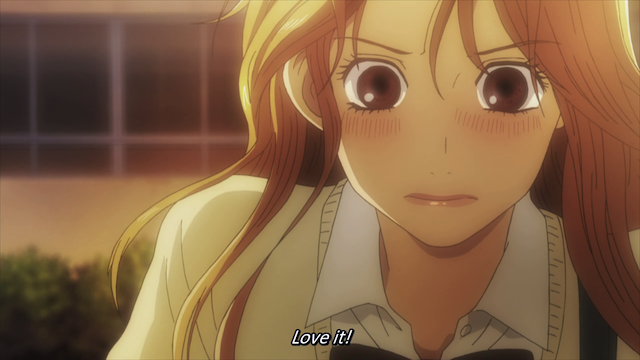 Maybe humans aren’t supposed to be perfect, but Chihayafuru clearly is. This series will go down in my book as the most solid series that I have ever seen. I have a tendency to love anime that show brilliance, even if they can be a bit uneven. I’m willing to overlook some flaws, because I tend to think of that as a sign of Art pushed to its limit. And yet here is Chihayafuru, a series that delivers a compelling viewing experience episode after episode. To me the pace has never once dragged. I have been sucked in to this show from the beginning of episode 1, and each week something remarkable is delivered. My only concern is that this wonderful experience will end. 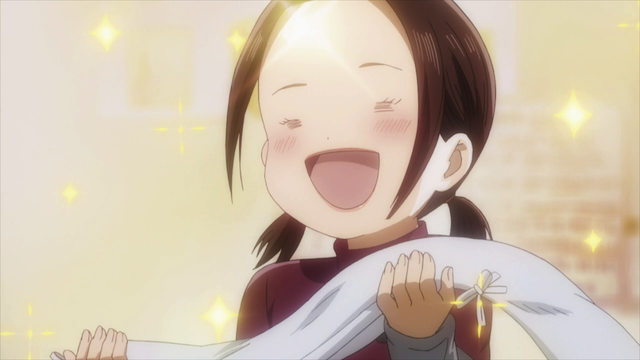 Now, I’m not saying that Chihayafuru is the most mind-blowing show I have ever seen. I still have a soft spot for shows like Mawaru PenguinDrum and Tatami Galaxy that delight with crazy ideas, even if there are times when they go a bit off the rails. Instead Chihayafuru is consistent — the amazing part is that it is so consistently GOOD. The dreaded exams that everyone was studying for in the last episode are over the second episode 21 opens. Attention naturally turns directly to Karuta. We get a funny mini-story in which Taichi Mashima trains himself while “reading” for the other club members. This causes Yuusei Nishida to go ballistic. Taichi is making a similar mistake to the one Chihaya made before. His strength is memorization, so he continues to develop it, but what he really needs to do is improve his weaknesses, such as his speed. There were two things that made this section so great; first the subtle way they revealed that Taichi was calling all 100 cards from memory, and second Nishida’s sincere concern for his friend. The Empress: "I find it hard to believe that you passed every one of your tests!" This was followed up immediately by a funny and touching scene in which the club’s adviser shouts from a window that Chihaya somehow didn’t fail her exams. While Kanade feels embarrassed for Chihaya, the follow-up comment from the Empress, wishing good luck at the Eastern Meijin Qualifier gets Chihaya all teary and she thanks Tsutomu for his tutoring. The whole scene is over quickly. It manages to show the development that has occurred in the various relationships, but it just takes about 40 SECONDS. It also flows smoothly from the previous scene between Mashima and Nishida and into the following scene at the Qualifier. 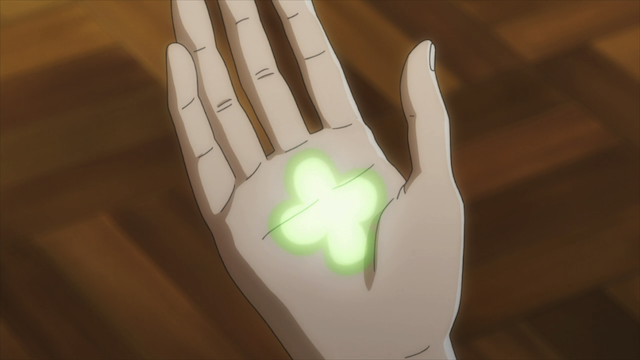 Four leaf clover -- even the Japanese believe in the luck of the Irish. The rest of the episode is the setup and execution of Chihaya’s first round in the Qualifier. This turns out to be an interesting match, where Chihaya gets to show (much as she did on her exams) that she has been working hard to improve. As Harada-sensei puts it, she has a new weapon to use for when she needs to face a truly formidable opponent like Queen Shinobu. This remark seems appropriate to Taichi as well, who hopefully will take Nishida’s advice and develop a new weapon of his own. Part of what made this match memorable was that Chihaya’s opponent was very likable and by no means a pushover. Plus a couple of things happened to hamstring Chihaya going into the match. 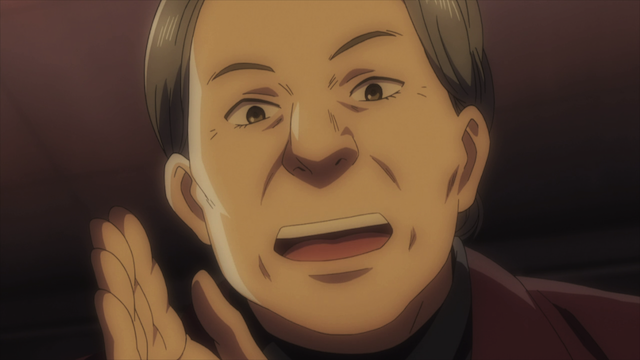 Her concentration was blown by Akito Sudou, and Chihaya is following Harada-sensei’s advice to abandon her speed. With all of that, Chihaya finds herself up against a prodigy. Well, sorry Ririka, but you’re going down! It would be a damned shame if she had to shave off those flowing locks. Chihaya managed to “accidentally” bet Akito Sudou that whichever of them lost first would have to shave their head. I hope Chihaya doesn’t have to shave her head. She looks great with that long hair. Besides, I’m hoping to see Chihaya face off against the Queen, Shinobu Wakamiya, or even Arata Wataya. We only have four more episodes. Please don’t let everything end with Chihaya losing and having to cut all of her hair off! Also, I don’t understand what he meant with his text to Arata…any ideas? Taichi’s comment was confusing. I think he was trying to encourage Arata while still being his rival. The confusing part was that he said his goal was to win the Western Qualifier — but he wasn’t even qualified to enter it this year. I’m guessing by goal, he was talking aspirationally about some time in the future. He is saying he wants Arata to win and himself to win, and he is only barely admitting that he can’t win right now (since he didn’t qualify to enter). Well, to be clear, I don’t know for a fact — that was just my impression after thinking about it. I didn’t realize there were extra rules related to advancing rank, so I could be missing something here as well. I think Taichi was trying to make Arata assume that he is competing in the Eastern Qualifier and that he’s working hard to compete against Arata at the finals (Arata might think that he actually qualifione to be promoted to Class A). 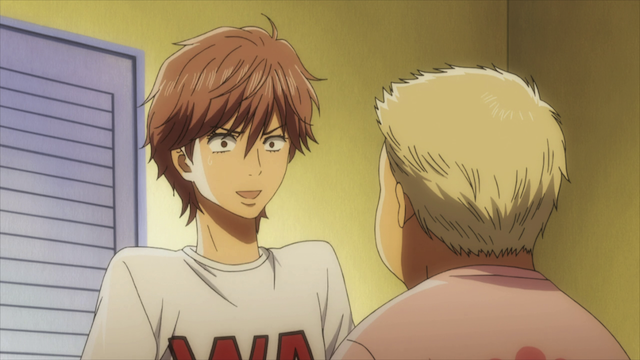 But, his (possible) main intention is to make sure that Chihaya meets Arata at the finals. Gah, I afraid to see the end of this series! That certainly isn’t impossible. I still think Taichi is saying it is something he wants to do in the future, but he is expressing it very aggressively — kind of like, “You don’t want me to take first place in a Meijin Qualifier do you? This is your last chance to show that you are ahead of me, because I’m gonna take this next year.” But it certainly is open to interpretation. (Arata knows Taichi was not promoted prior to the final tournament, in which he lost, so it doesn’t seem like it would be a good bluff). I can’t believe we are just about heading into the finale. I’m gonna miss this series when it is gone. I think it’s easy to overlook that Taichi could have easily beat Nishida in making Class A; considering the first time Taichi came in second in all of Class B, Nishida had already been eliminated. Nishida only beat Taichi by one card, and as they narrated in that episode, it was really a fluke win, depending on which card was called. I know Nishida was runner-up to Arata when they were young, but for someone who’s never really taken Karuta seriously, Taichi’s really amazing. He’s demonstrated on many occasions that he’s exceptional when it comes to the technicalities of the game (like memorizing card positions, or the cards themselves), but just like Nishida said, his strength is also his weakness: Taichi lacks HEART! At least for the game, haha. I wonder if Taichi and Arata switched physical locations if Taichi would do better. From the very first episode, Taichi has been the one character who’s “written off”, but with every episode that passes, we see how much potential he’s got, and how victory is really within his reach. I think (and I really, really hope) the end of the series will give us a big Taichi Suprirse! I think he has a lot of potential as well, but I think he still needs to work on his game to win the Meijin Qualifier. I’ll be satisfied if Chihaya wins it, and gets to face off against Queen Shinobu again. Ideally Arata will at least win the Western Meijin Qualifier, and it would be good to see him battle the reigning Meijin. I know that leaves Taichi out in the cold, but I don’t see how he can make a comeback in the few episodes that remain. You are so right! … Or just the tiny little moment with the Empress, where she seemed to be genuinely proud of Chihaya for scoring well on her tests. There are all of these side characters that are surprisingly well defined without falling into stereotypes.